Information pertaining to new admissions courses offered in the institutes, life in the society, campus life and so on have been given within the website. However, aspirants, visitors and students may have additional questions pertaining to the above, for which they are browsing the website and webpages of Sri Balaji Society and its four institutes. These questions have been listed and answered here and can be referred for query and doubt settlement. What is the Scope of Telecom Management in India? The Indian telecom sector is expected to generate four million direct and indirect jobs over the next five years according to estimates by Randstad India. The employment opportunities are expected to be created due to combination of expected growth of penetration in rural areas and the rapid increase in smartphone sales and rising internet usage. Mobile data consumption in India surpassed the combined usage of the US and China in 2017. With latent demand for data fueling the digital economy, 2018 could be the growth year for the sector where investment of around Rs. 3 lakh crore is estimated to be made in next two years. According to the Telecom Secretary, Aruna Sundararajan, year 2017 was the year of consolidation for the sector. Next year will be a year of growth for the sector. Post consolidation the telcos may be better placed to invest in new technologies and recruit skilled hands, boosting job prospects. With consolidation, the telcos will get the benefit of synergy amongst their operations and the overall cost of operations are likely to come down, leading to increased margins. As told to Press Trust of India (PTI) by COAI's Director General, Rajan S Mathews. The industry has already gravitated towards Internet-based technology. The telcos will move to innovative business models. Converged services with voice telephony, wired and wireless broadband, and television services along with content, Internet of Things, financial payments, are likely to help in better revenue stream. As conveyed to PTI by Deloitte Haskins and Sells LLP, Partner, Hemant Joshi. Another area to watch out would access of satellite phone services for consumers especially during air travel. India's telecom sector is also expected to make significant progress for deployment of 5G services in 2018. With Internet of Things, Artificial Intelligence, drones and robots promising to fuel future demand for high-speed data, therefore, growth for telecom industry. 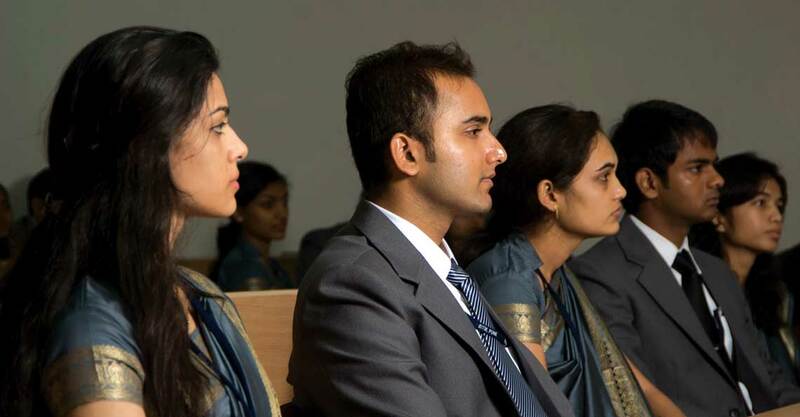 Why to do PGDM/ MBA in Telecom Management from Balaji Institute of Telecom Management (BITM)? Best Industry Institute Interface: BITM enjoys great industry interaction with large number of industry experts representing renowned organizations sharing their experiences. Their expertise and industry insight helps the institute to regularly update academic curriculum which is closest fit to the industry. Over 3000+ senior corporates have shared their rich experience with BITM students. Placement Opportunities: Campus Placement at Sri Balaji Society (SBS) is one of the USPs of the society. BITM has achieved nearly 100% placements year after year. Sri Balaji Society (SBS) has collaborated with Phillip Capital India for joint training and final placement of selected students of the Management Institutes of SBS with Phillip Capital India a leading financial services company, having branches in India and abroad. Combined placement for all the four management institutes of SBS saw more that 270 companies visiting campus by Jan 2018. The students are compatible and enabled to join all the sectors of industry such as Consumer Durables, Non-Durables, Services, Manufacturing, IT & ITES besides the niche segments of Telecom Sector such as IT & consulting companies, Research & Consulting, Service Providers, App and Gaming, Active & Passive Infrastructure, Digital Payments, BFSI and much more. and abroad. Program Design: The PGDM (Telecom) at BITM is designed with a holistic approach to business management including general management, marketing, finance subjects. Faculty: Training is imparted by the best in the Telecom education and industry. Therefore, it’s only the best engineers who get into BITM and therefore, you share space with the best brains in the techno-management space. SAP-MOU: Keeping in line with the demand for technology driven management, Sri Balaji Society has partnered with SAP India Pvt. Ltd. to provide SAP Global Certification to its PGDM students specializing in Systems. Selection Process: Sri Balaji Society is breaking barriers in education through its selection process. The Society has devised its screening process wherein the performance in GD/PI/Essay rounds of selection, carries 65% weightage, while the management entrance score has 35% weightage. No bar for the CAT Score. It has also been ranked as one of the robust selection processes by Business Today, Oct, 2017. Ranking: Ranked Amongst Top 3 Telecom Management Institutes in India by Outlook B-School Survey; Ranked as top 3 B-Schools in Pune (Times of India B-School Survey, February 2017); Amongst top 5 in Pune for selection process by Business Today, Oct, 2017 and many more. What kind of Job Profiles do the PGDM Telecom Students can get after engineering? Job prospects are great if one opts for PGDM Telecom after Engineering. The four years of investment in engineering is a perfect platform to pursue the techno management qualification for good career take-off. As the Telecom industry is investing in new technologies, it requires more professionally groomed managers in diverse roles to lead the industry to newer heights. The Techno Managers will always have an upper edge with their management education in Telecom Management with engineering background. Some of the niche segments of Telecom sector are IT & Consulting organizations, Research & Consulting, Service Providers, App and Gaming, Active & Passive Infrastructure, Digital Payments, BFSI and much more. There are many career options for Telecom Management student. Placements for these students usually happen of for the roles - Consulting, Business Processes / Operations Consulting, Revenue management, Pre-Sales / Post Sales, Deployment Management, Vendor Management, Business Analysis, Research Analysis, Business Development – mainly B2B, Revenue/ Fraud Management, Project Management, Domain Specialist, MIS, Data Analytics, Supply Chain / Logistics, Quality and Security Management etc. in all the verticals including Telecom. The Telecom vertical covers range of organizations like IT & ITES (Infosys, TCS, HCL Technologies, Wipro, Tecnotree, Elitecore, Alepo, Capgemini, L&T Infotech, Sonata Softwares etc.) Service Providers (Jio, Airtel, Vodafone, Idea etc), Research & Consulting (Frost & Sullivan, CRISIL, Evalueserve, Netscribes, Netcore etc. ), Active & Passive Infrastructure (Indus Towers, American Tower, Aksh Optifibre etc), Operations (Schindler India, Jio, Tata Teleservices etc. ), BFSI (Bajaj Allianz), Regulatory Bodies like TRAI, other organizations like COAI, TCOE-India and many more. Besides few other industries such as BFSI, Research, Consulting etc. require telecom domain experts. It is also interesting to note that most of these organizations share background information of their representative involved the project with their client. Therefore, matching qualification adds in gaining confidence of the client. Hence, there is something of interest for every budding techno-manager and BITM students are trained to be compatible to join all the sectors of industry such as Consumer Durables, Non-Durables, Services, Manufacturing, IT & ITES besides the niche segments of Telecom Sector. Why do MBA or PGDM Telecom after Engineering? Preferred managerial job profiles in Telecom industry requires an engineering/ technical background as the industry is adapting new technologies and that too at fast pace. And, industry experts feel that it is extremely important to have good managerial skills backed by domain expertise. The general management education, therefore, is insufficient to develop the techno managerial skills required for the industry. Hence, the best option is to pursue Telecom Management. Increasingly more and more organizations in the industry wish to hire MBA graduates on whom they have to spend least amount of time and energy in training and that is why Telecom Management graduates become a preferred choice for campus placement, being industry ready. In other words, your BE/ B.Tech. education can be seen as good foundation to pursue a techno managerial education- Telecom Management, ensuring your four years of engineering as a good investment. Besides industry attractiveness is another very important reason why should you do MBA or PGDM in Telecom. With latent demand for data fueling the digital economy, 2018 could be the growth year for the sector where investment of around Rs.3 lakh crore is estimated to be made in next two years. There are many career options for Telecom Management students. Placements for these students usually happen for the roles - Consulting, Business Processes / Operations Consulting, Revenue management, Pre-Sales / Post Sales, Deployment Management, Vendor Management, Business Analysis, Research Analysis, Business Development – mainly B2B, Revenue/ Fraud Management, Project Management, Domain Specialist, MIS, Data Analytics, Supply Chain / Logistics, Quality and Security Management etc. in all the verticals including Telecom. Besides few other industries such as BFSI, Research, Consulting etc. require telecom domain experts. The Telecom vertical covers range of organizations like IT & ITES (Infosys, TCS, HCL Technologies, Wipro, Tecnotree, Elitecore, Alepo, Capgemini, L&T Infotech, Sonata Softwares etc.) Service Providers (Jio, Airtel, Vodafone, Idea etc. ), Research & Consulting (Frost & Sullivan, CRISIL, Evalueserve, Netscribes, Netcore etc. ), Active & Passive Infrastructure (Indus Towers, American Tower, Aksh Optifibre, NSN etc. ), Operations (Schindler India, Jio, Tata Teleservices etc. ), Regulatory Bodies like TRAI, other organizations like COAI, TCOE-India and many more. Can I visit the Sri Balaji Society campus before applying for admission? Yes. We work 365 days a yea and you can visit the Campus any time. When can I apply to Sri Balaji Society for admission? Applications are now open to the PGDM programme. You can apply online here. How do I apply to the PGDM program at Sri Balaji Society? Please register here if you are interested in the PGDM program at the Society. You will receive a verification email. Once you verify your email account, you can start your application process. Where can I contact if I face any problems during the application process? What is the cut off score for CAT? What was the cut off score for the previous batch? At Sri Balaji Society, we do not believe that talent can be judged by a mere entrance score. While we place due importance to it, we do not have any cut off scores. My academic scores are not great. What are my chances for admission? I am still to take my final year graduation exam. Can I still apply for admission to SBS? Yes. If you are confident of securing a minimum of 50% aggregate marks you may apply to the PGDM programme at SBS. Where all are the GD/PI centres in India? How is an admission selection decision made? Sri Balaji Society evaluates your application based on various parameters mentioned in the ‘Admission Process’ section. The decision of the Society shall be final in this regard. You can check your online application account to get latest updates. We will also be communicating important milestones on email. Does Sri Balaji Society provide scholarships? Are the PGDM courses here eligible for loans? Yes. We have MoU with PNB, HDFC Credila, and Avanse. Please refer to section Education Loan. Is there a management quota? There is no management quota at Sri Balaji Society. Candidates are selected strictly on merit basis. If I choose not to join the program at a later stage, will I get fees deposited back? When will a waitlisted candidate know the final decision? This depends entirely on the availability of vacant seats. The seat is allotted to waitlisted candidates as and when a student withdraws admission. What documents do I need to bring to the GD/PI? You need to bring your admit card to the GD/PI centre. What is the status of Campus Placement? Where can I get year wise record/list of campus placement? We achieve almost 100% placements each year. We have a centralized placements process wherein students from any institute can apply for a job fielded by a company. However, this does not hold true if the Company itself is looking for students from a certain specialization. Is hostel accommodation available to all? Hostel seats are available on first-come first-serve basis. Hostel accommodation is available to almost all the female candidates in the first year. A good number of seats are also available for the male candidates. However, those who are not able to secure a hostel seat do find accommodation in PG/flats in the vicinity of the college, which are in plenty.